The Volvo Ocean Race is the world’s longest professional sporting event and leading offshore sailing competition. Seven teams will battle it out during the nine months of the race: Abu Dhabi Ocean Racing from the UAE, Team Alvimedica, the US/Turkish youth challenge, Team Brunel, the Dutch campaign, Dongfeng Race Team, a Chinese entry, Team SCA, the all-female team, MAPFRE from Spain and the Danish entry, Team Vestas Wind. The race began in 1973 as the Whitbread Round the World Race and a lot has changed since the first boats left England at the start of the first edition. However, the essence of the race remains exactly the same and it is well established as one of the Big Three global sailing events along with the America’s Cup and the Olympics. In 2001 its new owners rebranded it as the Volvo Ocean Race. The 2014-15 edition will be the 12th edition of the 41-year-old event. Volvo Ocean Race is a very human challenge and a battle with nature. For weeks at a time, the sailors are forced to contend with conditions ranging from freezing cold to searing heat, while waves constantly slam the boat and an incessant noise drills its way into their ears. 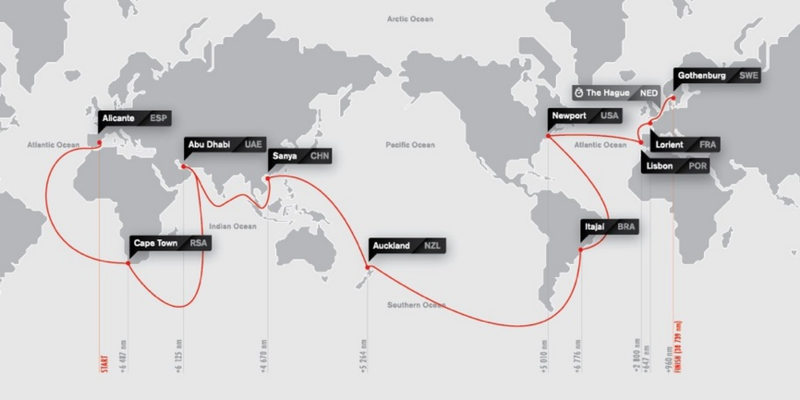 The race has always been run in legs and in 2014-15 there will be nine of them, with the boats covering 38,739nm (71,745 km/44,580 miles), crossing four oceans (Atlantic, Pacific, Indian and Southern Oceans) and visiting 11 countries in five continents: Spain, South Africa, United Arab Emirates, China, New Zealand, Brazil, United States, Portugal, France, The Netherlands and Sweden. Each host port stages a festival lasting around two weeks, featuring free family entertainment and a chance to see first-hand what the sailors have to put themselves through to succeed. In the last edition, crowds totalled 2.9 million at the 10 Host Ports around the world. The 12th edition of the event consists of nine offshore legs and 10 in-port races. The final leg from Lorient to Gothenburg will include a 24-hour pit-stop in The Hague. The in-port races are part of a separate series and will only count for overall race points in the case of a tie. The 2014-2015 race will use a low point scoring system, meaning that the team that finishes first in an offshore leg, or an in-port race, is awarded one point, and the team that finishes second, two points, etc. At the end of the race, the team with the least number of points will claim the Volvo Ocean Race Trophy. For the next two editions of the race, teams will sail a new boat class, the one design Volvo Ocean 65. One design means that all the boats are built identically and cannot be modified in any way by the teams. The introduction of the Volvo Ocean 65 has not only lowered the cost of a competitive campaign by around 50% but has also opened the door to new competitors and allows for equal sailing conditions putting more emphasis on the crews' performance and tactics rather than on the boats' design. The one-design boats have been designed by Farr Yacht Design, responsible for five winning entries in the 11 previous editions of the event. A consortium of four boatyards in Italy (Persico), France (Multiplast), Switzerland (Decision) and the UK (Green Marine) have taken care of the different stages of the build process. The fleet of seven Volvo Ocean 65s were sold ‘ready to sail’ from Green Marine and will be serviced throughout the race by The Boatyard as part of the boats’ guarantee. The Boatyard, a shared maintenance service for the Volvo Ocean 65s , has been introduced as part of the one-design concept to guarantee the boats’ optimum conditions throughout the race and a minimum of extra costs on behalf of the teams. The Volvo Ocean Race headquarters is located in Alicante, Spain and contains a state-of-the-art Race Control Centre from which the boats are continuously tracked around the world using sophisticated maritime technology and satellite communications. The crew size has been reduced from 11 crew (10 plus one onboard reporter) to eight plus one non-sailing multimedia reporter. All-women's teams are allowed three extra crew (11 plus one onboard reporter), which should allow them to be a truly competitive team against their male rivals. One of the great highlights for 2014-15 is the appearance of the first all-female team in over a decade. Team SCA, backed by the Swedish-based global hygiene and forest products company, were the first to confirm their participation and start training with the new one design in November 2013. Life onboard a Volvo Ocean 65 is as extreme as it gets. Unbearable temperatures, hostile weather and rough sailing conditions, constant dampness, sleep deprivation, one pair of clothes, restricted communications with the outside world and sustained competitiveness accompany the sailors for up to 25 days at a time. On each boat there is an embedded journalist, the Onboard Reporter who, exempt from sailing, is responsible for capturing the stories and adventures taking place onboard with images, video and text - a task we have billed as the toughest job in the media-world. As with the Olympic Games, there is no financial reward for winning the 38,739 nautical-mile race, yet no set of sailing honours can be complete without victory in the Volvo Ocean Race. The prize - the Volvo Ocean Race trophy - symbolises the glory of winning what is still one of the most extreme challenges in the world of sport.